Consuming a balanced diet that includes foods from all of the food groups is the healthiest option for adults and children. Including a variety of fruits, vegetables, whole grains, lean proteins and healthy fats in your daily routine is the best way to get the nutrients you need while also controlling your intake of calories. Using a shopping list that includes healthy food choices like the printable one provided here is a great way to start getting in the habit of making wise food choices. Click the top image to download a printable grocery shopping list based on healthy food choices that you can easily customize to match your family's food preferences. f you need help downloading the printable, check out these helpful tips. This printable is a great tool for creating a healthy shopping list that you can use over and over. Just be sure that each item you add is a healthy one! You have probably heard the expression, "Breakfast is the most important meal of the day." In many ways, it is. 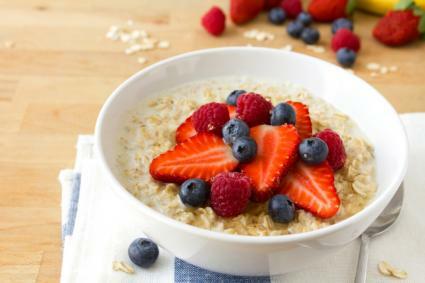 Adults who eat breakfast are able to focus better during the day and are less likely to gain weight over time. Children who eat breakfast tend to achieve better results in school than those who do not. Rather than eating a sugary breakfast cereal, try to include nutritious options that help maintain your energy levels through the morning. Focus on consuming whole grain cereals, English muffins, and breads. Don't forget whole fruit or fruit juices and milk or enriched dairy-free beverage alternatives. Snacks are an important part of your healthy eating plan. Think of snacks as miniature meals that can add important nutrients to your diet. Snack only when you are truly hungry and plan your snacks ahead of time. 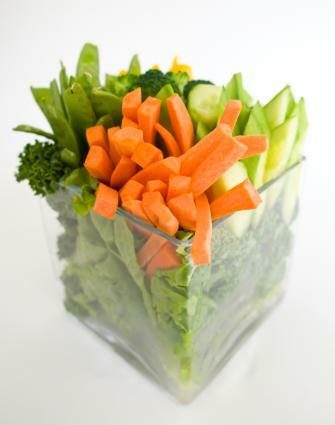 Have something healthy on hand such as fresh fruits and vegetables. Keep dried fruit, whole grain crackers, and nuts in your desk at work or in your car for when you forget to bring your snack along. Lunch can be the trickiest meal if you are trying to stick to a healthy diet, because this is the time of day when you may be away from home. Packing your lunch ahead of time can help you to make sure you have healthy options on hand when the lunch hour strikes. 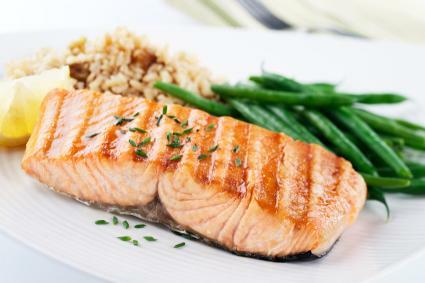 Preparing dinner at home can save you plenty of money and is a great way to ensure that your family is eating well. Try making large batches of your favorites dishes and then freezing some of the leftovers for later use. You can refrigerate or freeze leftovers in single serving containers, which make an easy lunch option for later in the week. Here is a sample menu plan for one day's worth of meals for one person. You can double this plan if you are cooking for two. 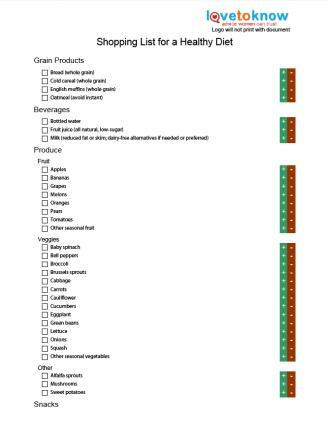 Be sure to add or change the items on the shopping list to create a meal plan that fits your individual needs. When you are first beginning on your quest to consume a healthy diet, it is a good idea to plan your meals out for the week ahead of time, adjusting your saved shopping list accordingly. Planning ahead will prevent you from purchasing so much food that it spoils. It will also help you to avoid running out of healthy options at home, which may send you running out the door for fast food or other less wholesome options when your tummy starts to grumble. Never shop when you are hungry. This way you are less likely to make impulse purchases on high priced foods that are less nutritious. Keep a running shopping list of items at home that need to be replaced; you will be less likely to forget something. This will cut down on trips to the grocery store. Arrange your list according to the sections of the store. For example keep all of the produce together and all of the meats together. This saves time and prevents you from having to make more than one trip to each aisle when shopping. Plan your meals for the week based on which produce is in season and on sale. If you are worried about produce going bad before you can eat it, buy vegetables that last longer in the refrigerator. Examples of longer lasting options include broccoli, carrots, onions, cabbage, and Brussels sprouts. Buy green bananas and allow them to ripen at room temperature. If you are a single person or have a small family, wrap and freeze bread to keep it fresh longer. Remove a few slices at a time when you are ready to use it. Buy frozen vegetables for use in soups, casseroles, and stews. This way you can take out what you need and save the rest for later. With a little forethought and planning, you can incorporate healthy eating into your busy lifestyle. If you feel you need some individual help, a Registered Dietitian can help you create a healthy meal and shopping plan. The transition may seem a bit overwhelming at first, but you will be happy in the long run when you see the difference you are making in your health and your wallet!